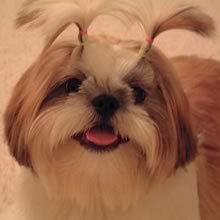 The Shih Tzu gets along well with other household pets and children. Though the Shih Tzu may bark frequently, it does not make a good watchdog. Shih Tzu require an ample amount of exercise for their small stature. They are happy with daily walks or romps in the yard. Shih Tzu cannot regulate their body temperature easily, which makes them highly prone to heat exposure; they should never be over exercised or left outside in hot weather. The Shih Tzu is well suited to apartment life. Over 50,000 Puppies for Sale - Shipped Worldwide! Finding the right puppy can be dog gone hard work. PuppyFind® provides a convenient and efficient means of selecting and purchasing the perfect puppy (or puppies) from the comfort of your home, 24 hours a day, 7 days a week. Take advantage of our PuppySearch or leisurely browse our directory of hundreds of dog breeds, dog breeders, dogs for adoption, and puppy for sale listings with photos and detailed descriptions. Some puppies for sale may be shipped Worldwide and include crate and veterinarian checkup. Many dog breeders with puppies for sale also offer a health guarantee. With over 50,000 puppies for sale and 100,000+ active dog breeders, you're sure to find the perfect puppy.